Starting with version 3.2, GTK+ comes with an experimental "Broadway" backend that allows rendering GTK3 applications in HTML5-capable browsers, so you can run applications remotely, using only a web browser. Ubuntu doesn't enable this Broadway backend by default, but thanks to Nicolas Delvaux's PPA, you can easily give this a try in Ubuntu 13.04, 12.10 or 12.04. Important: The GTK+3 with the Broadway (HTML5) backend PPA is available for Ubuntu 13.04, 12.10 and 12.04 and provides the same GTK+3 version available for those Ubuntu versions (but obviously, with Broadway enabled). That means that if you've added some PPA which has a newer GTK3 version (like the GNOME 3 PPA), you won't be able to use this PPA unless you purge the other PPA or downgrade the packages! "UBUNTU_MENUPROXY=" and "LIBOVERLAY_SCROLLBAR=0" are required because with the global menu and overlay scrollbars enabled, the applications segfault. You can also use this from a remote machine, by entering your IP followed by the 8080 port. In my test, this also worked using Firefox on my Android phone. To specify the port (if you use a different port for each app, they can run in the same time), use "BROADWAY_DISPLAY=" followed by the port number (e.g. : BROADWAY_DISPLAY=8081) in the command used to launch the application. 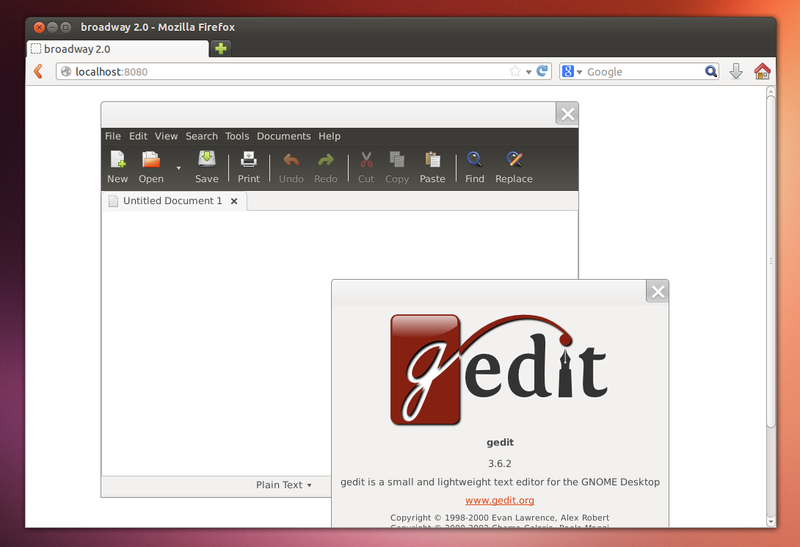 Remember: you can only use this with GTK3 applications. There is another PPA which provides the latest stable GTK 3.8 for Ubuntu 13.04, that comes with some extra features, like password protection, running multiple GTK+ applications in the same web browser and more, however, since Ubuntu 13.04 doesn't come with GTK 3.8 by default, I don't recommend using this unless you only want to test it in some virtual machine or you plan on using Broadway on a server. You can find the Ubuntu 13.04 GTK 3.8 with Broadway PPA HERE - make sure you read the PPA description since Broadway works a bit differently in GTK 3.8.